Today and last Sunday, the lectionary has directed our thoughts to Hebrews 11, the great ‘Faith Chapter’. Key Old Testament figures of faith are remembered in this chapter: Abraham, Isaac and Jacob, Samuel, David, and others. Of course, if we were writing this list today we may have included Sarah with Abraham, and named more women than Rahab. Women like Hagar, Ruth, Deborah and Judith would really round the chapter out for many of us. The stories of people of faith can be a great encouragement to us. The people of faith we ourselves know can also encourage us. I want to tell you about a time when I wondered if I really was a person of faith after all. A time when I thought my faith may just evaporate. I am very grateful for a bible study I attended at the House of Freedom Christian Community in West End, Brisbane over thirty years ago. It was led by Han Spykerboer, who a few years later became my Old Testament professor. Han took a piece of chalk and a blackboard (remember them?) and took us through the narrative of Genesis 1, showing us that the universe of Genesis 1 was nothing like the universe we know today. Therefore, it couldn’t be a scientific account of how the universe and life itself came into being. Indeed, it wasn’t intended to be that kind of story, but pointed to God’s lordship over all created things, and God’s lordship over the gods of Babylon. 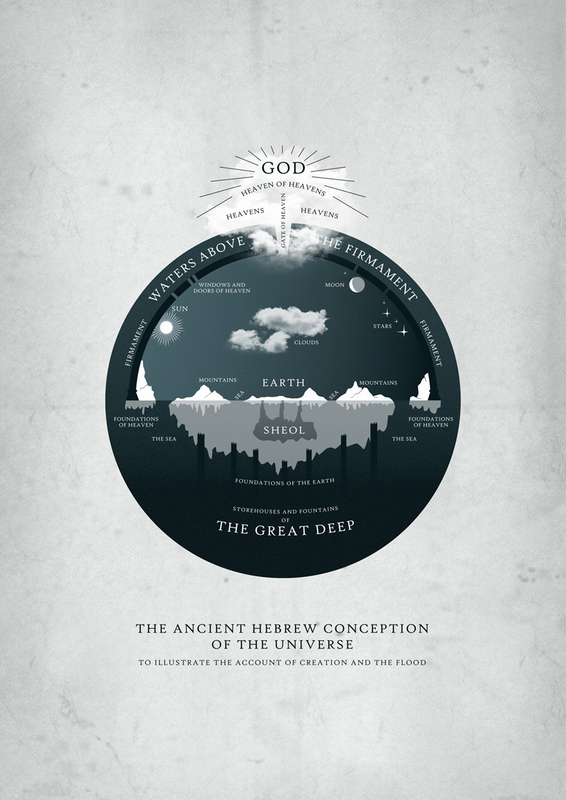 Look at the universe depicted here, and compare it with the story of Genesis 1 and the Flood. The Bible teaches that God is the origin of all things, but it doesn’t require belief in creationism. I’ve had many formative experiences as a Christian; one of the most significant was the period between 1977 and 1983 as part of the House of Freedom Christian Community, centred in the inner-city Brisbane suburb of West End. In that time, I was sometimes in the thick of things, sometimes more on the edge; for two years I lived in common purse, where we took our inspiration from the earliest Christian community of Acts 2. Looking back, it’s a time I wouldn’t want to be without. I got to know wonderful people, some of whom have since died or moved on. I think the thing I learnt about most was my own inadequacy without the people God gives me in life. I can’t make it alone, because I am a broken being. So it was great to have a catch-up chat a few days ago with Rowena Aberdeen, whose own search for community led her to spend time with the Iona Community in western Scotland. Rowena has written something of her own reflections on living in community. I resonate with her discoveries, and wonder afresh how much better I could have done living in community. Thanks Rowena! This comment by Rowan Williams from his book ‘Silence and Honey Cakes’ in many ways sums up the reasons I chose to go and live and work with the Iona Community for three years. Of course, before I arrived I could not have articulated this thought so clearly. Still, in the years I spent as MacLeod Centre Warden I lived into the deeper meaning of this phrase – with all its attendant joys and challenges. In our world today, most of us can choose our ‘neighbours’ – those we socialise with are usually people like us, who reflect the world as we see it. We struggle with church or office politics, and breathe a sigh of relief that we leave at the end of the day or only see people once a week. So what happens if you put yourself in a position where you can’t walk away? Where your colleagues must also become your friends and family and support. Where, as we say on Iona, we choose to be open to unchosen relationships. Well, then life gets interesting! The unchosen neighbour provides us with a different perspective. A mirror that does not reflect our own preconceptions but instead holds us accountable to recognising who we really are, rather than who we like to think we are. It is in this way our neighbour gives us a new context: a different and perhaps more honest place in which we must put all our values and intentions into daily practice. We are all wonderful and loving people … until we have to engage with the messy reality of human relationships, where nothing is perfect and we must wrestle each moment with our ideals versus the interactions that make up our days. Am I really kind and generous? Or only when I’m not tired and stressed? Am I really good at communicating? Or only when the other person reacts appropriately? How do I react when I have to deal with the negative consequences of another person’s actions? Especially when I think they were wrong in the first place? Am I really loving, or does judgement and righteous indignation creep in? We all know our ideals in these situations, what we believe about ourselves and how we think we would act, but it is in the testing of these that happens when we live among unchosen neighbours that we begin to see if these beliefs show through in our actions. In community living we can no longer pretend we are our intentions: we must recognise we are our actions, including our actions in tiredness, stress, hurt and conflict. In this, we come face-to-face with our own brokenness. Luckily, for me anyway, daily life also provided many opportunities for a stumbling and halting progress towards a truer love for those around me. A daily practice of love. Anywhere else and I would have run away from that practice. I know because even on Iona I tried. Everyone tries, because deep love is hard – uncomfortable and challenging. I had to give up valuing ‘right’ and ‘fair’ and instead seek the deep truth of another’s story, no matter how foreign to mine. On Iona you can’t run away. You need your fellow staff; they laugh and cry with you, support and socialise with you, give you what you need to survive a busy and challenging season. So eventually you turn up and try again (and again … and again! ), and in that you find moments of grace, of a love you didn’t think you had and moments where the Spirit moved when you’d thought it impossible. Don’t get me wrong – not all relationships are reconciled and not all people become close friends. But you can move a step or two closer to being able to love others for who and what they are in your life, whether that be a close companion who provides nourishment and support, or someone who mirrors to us our judgemental attitudes because they trigger them all. Both are important to our journey; both help us to be open, to grow and to slowly move from brokenness to wholeness, as individuals and as community. I love something one of my fellow Resident staff said: ‘When I’m not living in community, I’m a lot more careless with my relationships.’ Being on Iona and living in community has taught me more about the value of all the relationships present in my life, and for that I am grateful.